As much as I love writing about London, when it comes to writing about my latest travel adventure, I get all excited to share it with you. I’m a person that definitely gets excited booking a holiday and when I don’t have a trip booked or I have just got back from one, I’m eager to go away again. Mykonos lived up to my expectations and more, so I wanted to share some images from my trip, don’t worry the slideshow isn’t coming out (is that still a joke anymore?) 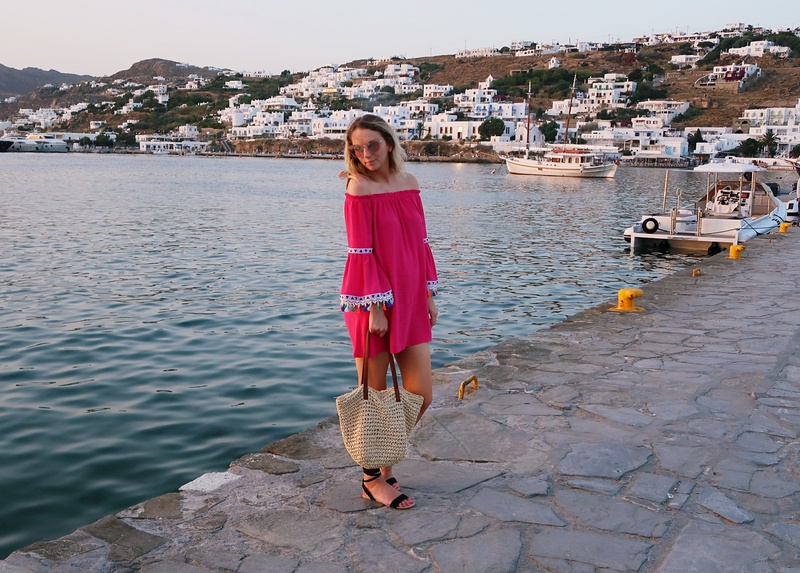 and fill you in on why Mykonos is a must-visit and why I think you should add it your travel bucket list. For me Santorini and Mykonos had been on my to-go to list for a long time and they were places I had always dreamt of going to. 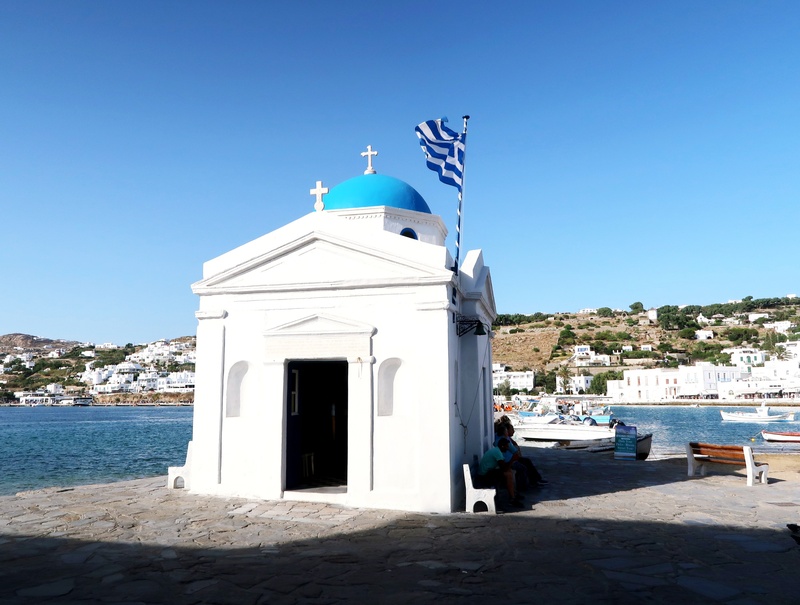 I’d only ever been to Greece once before to Kefalonia, which is a very small pretty island and one I would recommend, but every time I saw those white and blue perfect images of Mykonos, I knew one day I had to visit. Everything is exactly as you see it on Instagram, picture perfect white walls and blue rooftops. The sea is blue, the sky is blue and everything just looks so effortlessly beautiful. It’s the perfect backdrop to your vacation and one you won’t forget. 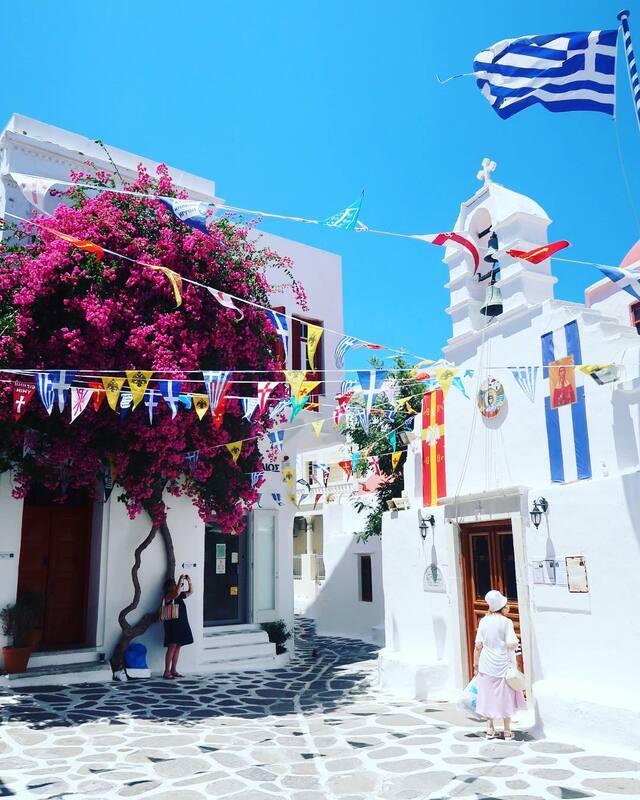 Mykonos Town has a maze of streets that all wind together with lots of shops, restaurants and bars to discover. Here you will find plenty of shops that sell beachwear, clothing and jewellery and as the streets look the same, the shops start to look the same too. They all sell very similar things that it is pretty easy to get lost. 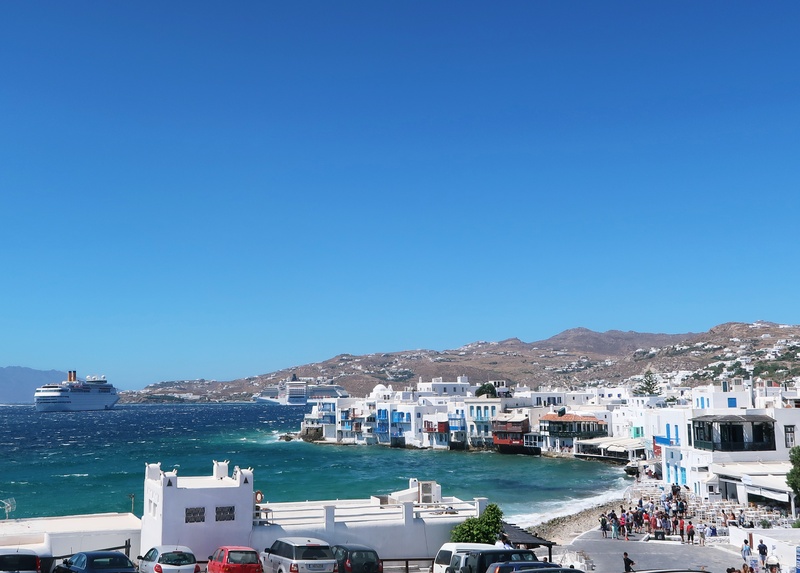 There is also shops such as Sephora and Louis Vuitton, which you wouldn’t always expect to find on a Greek island, but it’s quite a nice mix-up and what makes Mykonos different from say to Santorini. 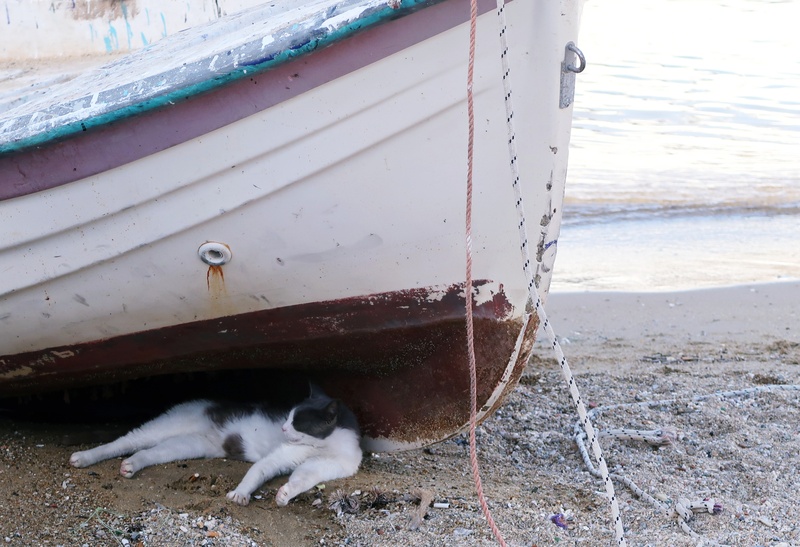 There are plenty of gelato and frozen yoghurt stops, so make sure to grab one of those and look out for the cats, although they are everywhere so you can’t really miss them. 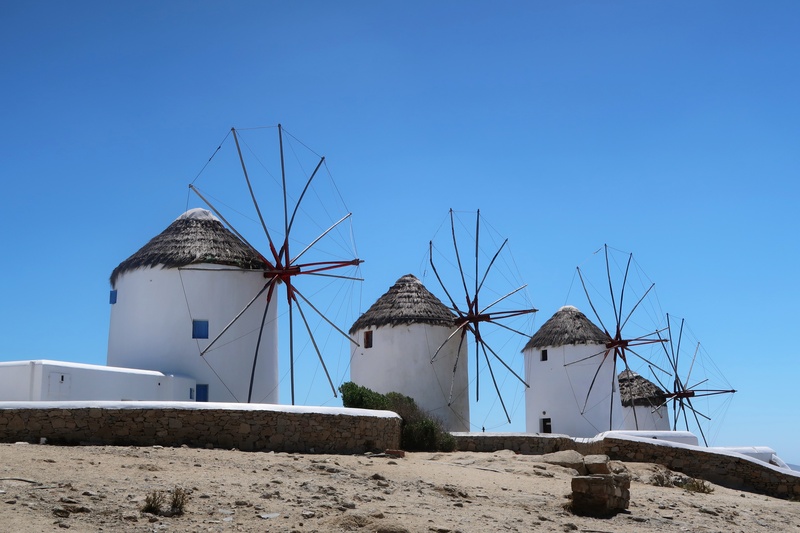 Don’t miss out on seeing Little Venice and if you climb up the hill, you will get to see the famous Mykonos windmills. 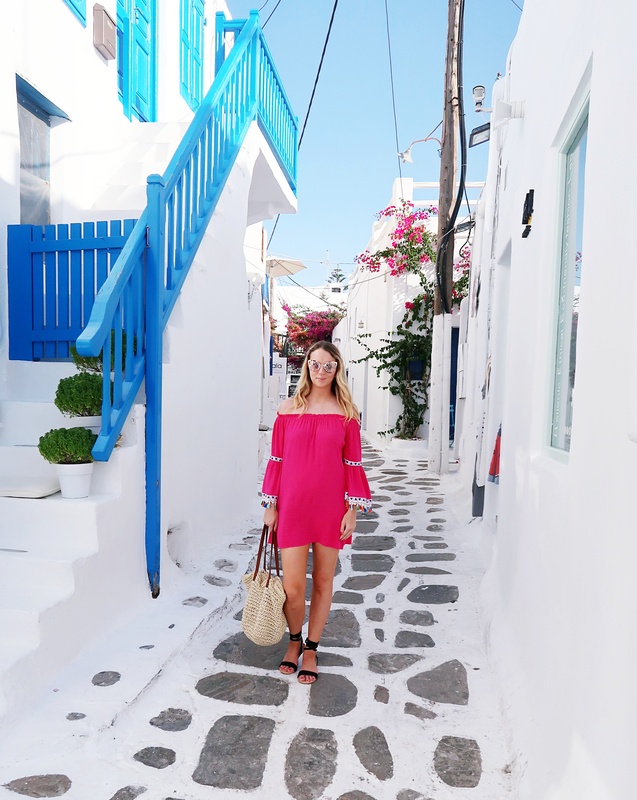 We visited Mykonos as a couple and we found it a perfect place to chill out and relax. Throughout the day we could lie by the pool and just stare at the sea. We were slightly out-of-town in Agios Stefanos and this area was very chilled out and quiet. In the evenings Mykonos town wasn’t too busy for meals or in the bars, but it all depends where you go and what time. Into the late evening it can get very busy in the summer months, but other than that it is easy to get lost here and just do your own thing. Something I didn’t experience, but Mykonos is said to have a very vivid nightlife. We were definitely more a go to the bar for a few drinks couple, than raving all night. But if you want to do that, there is definitely plenty places to go. 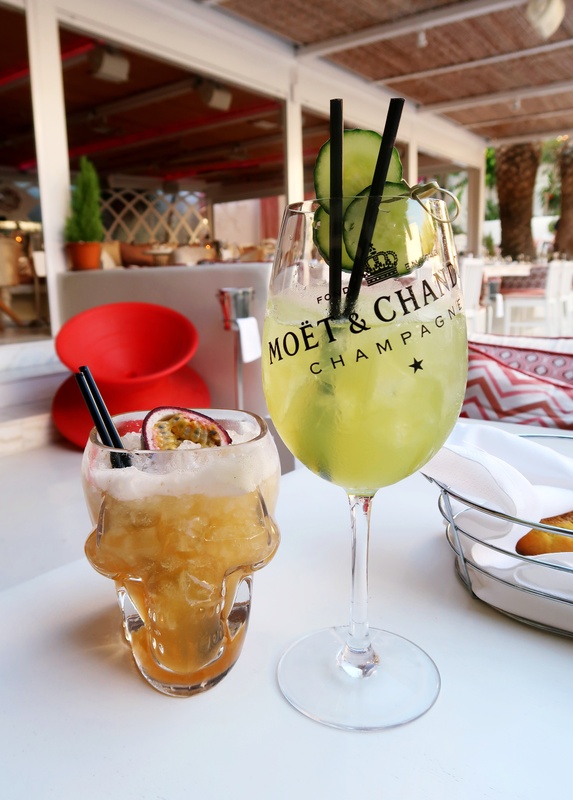 Being Mykonos some places offer bottle and table service, where you could spend into the thousands, so I’d recommend doing a bit of research into what sort of club or late bar you’d like to go to so you don’t go over your budget. 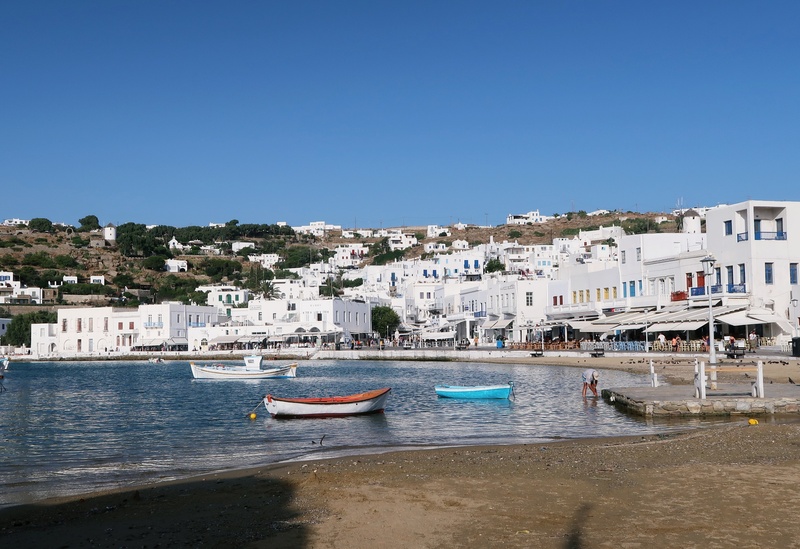 If you love Greek food you’re in the right place, but Mykonos also has a varied amount of restaurants with some superior fine dining such as Ling Ling and Uno Con Carne. There is something for everyone, superb seafood to Greek salads and I recommend trying the local Greek wines. Cocktails seemed to be a big thing, much to my delight. If you love your food then do check out my post on the best restaurants in Mykonos I’d recommend visiting. 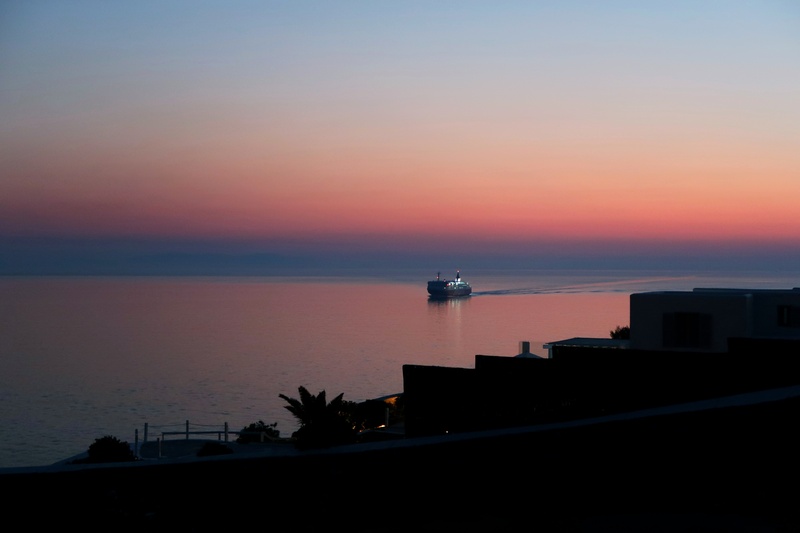 You can’t miss the sunset in Mykonos. 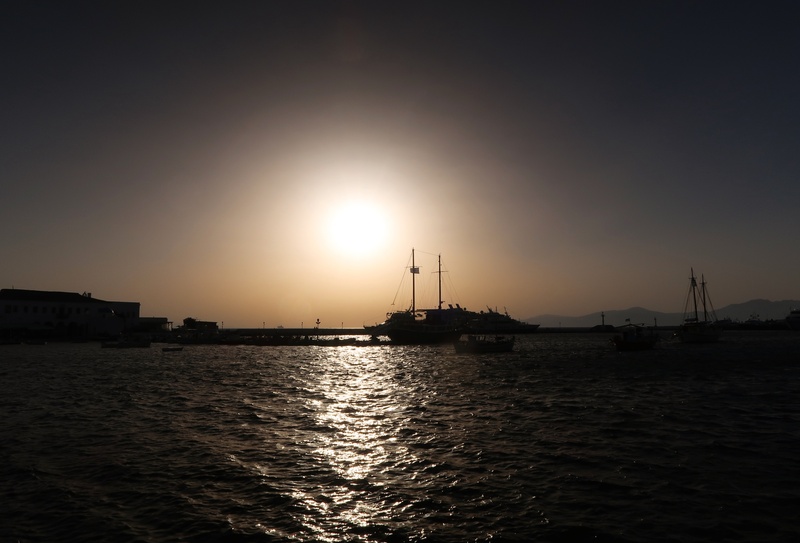 The sunsets in the Greek islands are always breathtaking and Mykonos is no exception. Living in the city, you just don’t see a sunset like this, so seeing sunsets like this every night in Mykonos was truly beautiful. Have you visited Mykonos before? Wow! 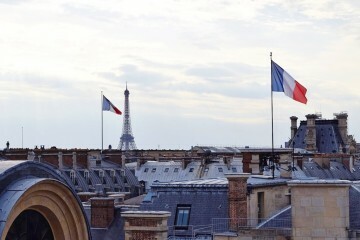 Such a beautiful place! 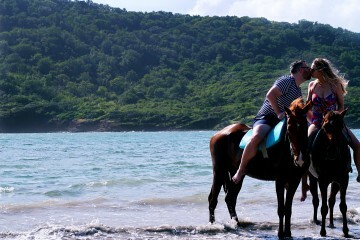 Especially the beach, it’s so relaxing! I’ll definitely pay a visit soon.